Kershaw (shoulder) threw a 20-pitch, all-fastball bullpen session Monday, Jorge Castillo of the Los Angeles Times reports. The session was Kershaw's first off a mound since February 20, the date on which his frustration with the state of his arm first appeared. He remains without any serious injury, and manager Dave Roberts believes he can be ready to go by Opening Day, but he'll have to stretch out quite a bit and work in his other pitches before that becomes a possibility. 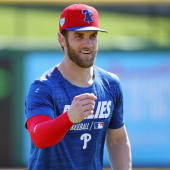 Kershaw was pleased with the session, Ken Gurnick of MLB.com reports, though he didn't give any clear indication about his readiness for the start of the regular season.